There is no development at the High Court in respect of Paddy McKillen’s (and Denis O’Brien’s) application for an injunction against the Sunday Times and its reporter, Mark Tighe – there are no new filings and we are now well past the six weeks which was intimated would be the full hearing date when the partial injunction was obtained by Paddy at the end of March 2013. The Sunday Times has in recent weeks provided some additional reporting of the general matter subject to the injunction, and it seems one of the details is that Paddy sought what was described by the Sunday Times as an emergency loan approval last October 2012 to pay some of the €25m estimated legal fees which Paddy was ordered to pay when he lost his High Court challenge against the Barclay brothers. The Sunday Times reported that Paddy sought approval for a [CORRECTED] GBP 5.0m (€6) – the Sunday Times refers to a GBP 5m (€5.9m) loan in one part of the story and a [CORRECTED] GBP 5.9m legal fees bill elsewhere [CORRECTION: the loan sought was €5.9m but the legal fees bill that was falling due to be paid was GBP 5.9m, in other words, Paddy was seeking a loan for just part of the legal fees bill] – loan to pay the legal fees that he was required to pay on account, pending the appeal of the decision, the outcome of which we’re still eagerly awaiting. The Sunday Times reported that the board of IBRC – remember Mike Aynsley was then CEO and Alan Dukes was chairman – approved the loan. According to Paddy, he eventually decided to fund the [CORRECTED] GBP 5.0m element of the GBP 5.9m legal fees from elsewhere. The parliamentary question and response is here. I am not aware of any breaches by IBRC of the Commitments contained in that decision. According to the US court service, PACER, there have been 52 filings so far in Sean Dunne’s bankruptcy in Connecticut – the betting is that by the time this bankruptcy is resolved there will be a multiple of 52. 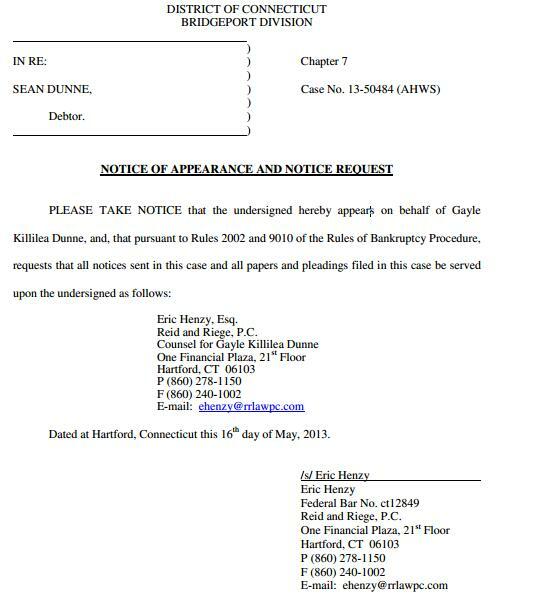 Yesterday’s filing is by Sean’s wife, who is now styled “Gayle Killilea Dunne”, not Gayle Killilea and not Gayle Dunne. Gayle’s request is to be recognized as a notice party in the bankruptcy under Rule 2002 and Rule 9010 of the Rules of Bankruptcy Procedure. Rule 2002 applies to “Creditors, Equity Security Holders, Administrators in Foreign Proceedings, Persons Against Whom Provisional Relief is Sought in Ancillary and Other Cross-Border Cases” and requires the applicant to be treated as notice party to the bankruptcy proceedings. Rule 9010 appears to simply allow the notice party to be represented by a lawyer. Gayle has engaged Connecticut law firm Reid and Reige and her specific lawyer is Eric Henzy, described on his bio at the firm as practicing in “business bankruptcies and workouts and business and commercial litigation”. Take Paddy McKillen, pictured below right. 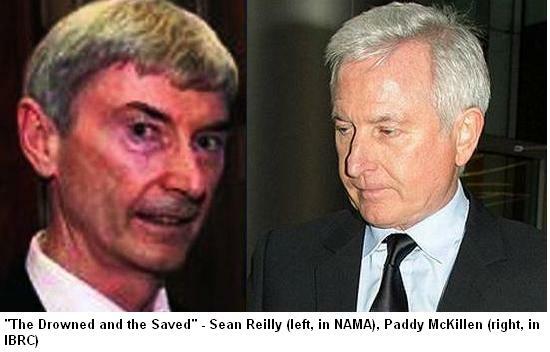 In 2010 and 2011, he fought tooth-and-nail in Dublin’s High Court and Supreme Court to stop NAMA acquiring his loans. In the end, the Supreme Court judges decided that NAMA could acquire Paddy’s loans but would have to consult with him beforehand. Despite swearing blind at the High Court that Paddy’s loans were “systemic”, NAMA abandoned the fight and decided not to acquire Paddy’s loans which remained at IBRC and Bank of Ireland. Because right now, Paddy has been given a window to refinance his IBRC loans – estimated to be €300m of personal loans and €550m of corporate loans. To refinance his loans, Paddy must repay them 100% and Paddy has been having a whinge through the press recently that IBRC is not accepting his most generous offers which are almost equal to what Paddy owes. Paddy’s window to refinance at 100% expires soon; originally, the liquidator at IBRC was going to have the loans valued by the end of May 2013 and they would then be offered to the market, unless they had been refinanced at 100%. That valuation of the IBRC loans by USB and PwC due at the end of May, seems to have slipped but regardless, it will be a matter of weeks when the un-refinanced loans are offered to the market. Why is Paddy lucky? Because, even after his refinancing window closes, he will be able to bid for his own loans, and if his bid is the highest and if the bid is in excess of the independent valuation, then Paddy will be able to acquire his loans at a discount. So IBRC into which we have shoveled €34bn will be selling its loans to the market, and if the borrower is the highest bidder for those loans then the loans will be sold to the buyer at a discount, or in other words, the borrowers will receive debt forgiveness or a debt writedown. To illustrate, if Paddy has personal loans of €300m today, he can refinance these today at 100%, that is pay IBRC €300m and any outstanding interest and fees. After the refinancing window closes, then IBRC will offer Paddy’s loans to the market and say the highest bid is €200m and this is in excess of the market value of the loans, then they will be sold to that bidder regardless of who that bidder is. If it’s Paddy, then he gets €100m of debt forgiveness, no questions asked. 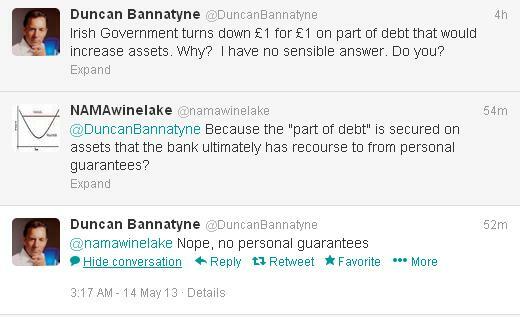 Contrast that with NAMA which is prevented by the NAMA Act from selling assets back to debtors below their par values. So, if a NAMA debtor owes NAMA €300m and offers NAMA €200m for them, and if NAMA markets the loans and €200m remains the highest bid, then NAMA can NOT sell the loans to the NAMA debtor. Which brings us to Sean Reilly (pictured top above, left) who happens to owe NAMA about €300m according to press reporting. Sean is prevented by the NAMA Act from having an interest in buying these loans. The best Sean can do is show some leg to potential investors and try to get them interested in bidding for the loans, and the best Sean can hope for is to act as a consultant after the loans have been sold to someone else. Minister for Finance Michael Noonan is clueless about all of this, he doesn’t know how much the NAMA proscription is costing NAMA and by extension the State. He also doesn’t know why there is one rule for IBRC disposals and another entirely for NAMA’s. What an eejit, and given he is being advised by the Department of Finance on these policies, what a bunch of eejits are employed there. The Minister was responding to a parliamentary question from the Sinn Fein finance spokesperson Pearse Doherty. The response must count amongst the most nonsensical you’re ever likely to see. Deputy Pearse Doherty: To ask the Minister for Finance the reason the Irish Bank Resolution Corporation borrowers will be eligible to buy their own loans at less than par value when such loans over €10m are offered to the market imminently, but that borrowers at the National Asset Management Agency are precluded by the NAMA Act from buying their own loans at below par value..
Minister for Finance, Michael Noonan: As previously advised, independent third parties are being engaged to independently value the loan assets of IBRC (in Special Liquidation). There is an obligation on the Special Liquidators to ensure that assets of IBRC are sold at a price that is equal to or in excess of the independent valuations that are being obtained. A process is currently being finalised that ensures that maximum value is extracted from the loan sales. The Special Liquidators are responsible for putting in place a liquidation process which fulfils their obligation under the IBRC Act and where applicable the Companies Acts. It is a matter for the Special Liquidators to determine what bidders constitute qualifying bidders for the purposes of the sales process. The protocol which is in place for the disposal of the IBRC assets is guided in a specified manner as the Special Liquidator will only be holding the assets for a limited period of time. Any assets that are not sold to third parties for a value higher than the independent valuations will be sold to NAMA at that price. Assets that are transferred to NAMA will then be subject to the protocol according to the NAMA Act 2009. It is the objective of NAMA in any loan sale to achieve its commercial mandate of obtaining the best financial return on behalf of the State. In accordance with the NAMA Act procedures have been put in place by the Agency to achieve these objectives. So far, the bankruptcy in Sean Dunne’s bankruptcy case has sought to subpoena three companies and individuals – Credit Suisse, People’s United Bank and an employee of the property company Bruce Shaw called Andy Smyth. Today, the trustee, Richard Coan has made a fourth application for a subpoena and this latest application is seeking to have NAMA questioned on 28th May 2013 about matters relating to Sean Dunne’s bankruptcy. You may have gotten the impression that NAMA was Sean Dunne’s sole creditor, but in fact Ulster Bank rivals NAMA for title of biggest creditor and the bankruptcy trustee has a duty to all of the creditors. The trustee is seeking to question NAMA under a provision of the US bankruptcy code known as a Rule 2004 Examination which allows the trustee to question NAMA under oath and seek documentation. Sean Dunne’s creditors meeting has been postponed to 29th May 2013, so it would seem that NAMA can kill two birds with the one (airline ticket) stone by submitting themselves to the bankruptcy trustee on 28th May. The full application for an order, which is likely to be approved by the judge, is here. The “independent valuation” of IBRC’s loans by PwC and UBS was originally supposed to be completed by May, but that might slip to June – remember NAMA still hasn’t got EC approval for 40% of its acquisitions from 2010, so this plan to value loans which had a par value of €27bn last June 2012 and a book value of €16bn, looks ambitious. When the “independent valuations” are complete, that is when the IBRC Special Liquidator will offer the loans to the market. Some borrowers are trying to refinance their loans now before the loans are valued and offered to the market, but they need repay 100% and meet any other contractual payments required under the loan agreements. One IBRC borrower who doesn’t look like he can refinance his loans 100% is star of the original production of the Dragons Den format on the BBC, Duncan Bannatyne (pictured above). If you’re not familiar with Duncan, he’s like our own Ben Dunne minus the coke and the prossies, having successfully built up a chain of fitness centres, though he has a varied background which includes mobile ice cream sales, nursing homes, kindergartens and writing. He is most recognized in the UK as one of the original investors and business angels on the BBC’s Dragons Den. The Daily Mail this morning reports that Duncan was originally advanced the loan in 2006 by what was then Anglo, to buy 24 health clubs from the Hilton group. Duncan is now in the same boat as Paddy McKillen, Denis O’Brien and a slew of other borrowers who have a window to refinance their loans at 100% or else face having to bid for their own loans and possibly – in the case of Paddy McKillen at least – see their loans sold to business rivals. And any unsold loans will eventually end up in NAMA, something that Paddy McKillen at least wanted to avoid at all costs previously. Paddy McKillen has been making headlines recently with his well-publicised bid to refinance €179m of his loans at par. Paddy is understood to owe IBRC around €900m comprising €300m of personal borrowings and €550m of corporate borrowings. He was attempting to refinance part of these loans at 100% but says that the Special Liquidator insisted he pay 100% of the €179m loan plus €7m early repayment fees, and although Paddy says he was prepared to pay the former, he wasn’t prepared to pay the latter. 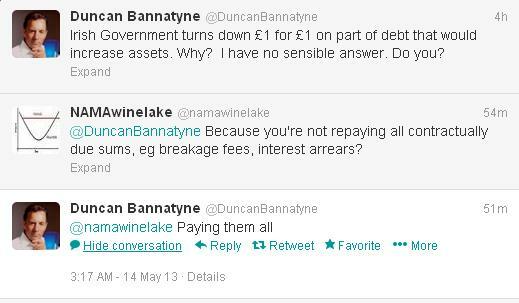 It is unclear why Duncan would only offer to repay part of his loan. Presumably it would give him greater leverage over the underlying health clubs, and it might deter bidders when the remainder of the loan is offered to the market. 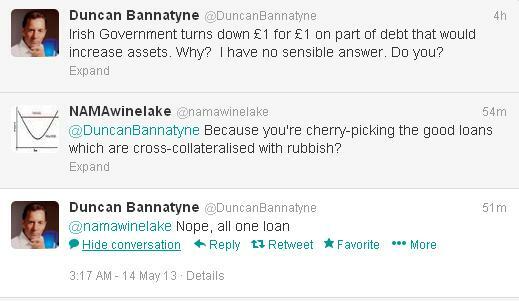 On the latter point, Duncan claims that no-one has been appointed to value his loan. He didn’t respond to a Tweet that both UBS and PwC have been appointed by the Special Liquidator of IBRC, to value loans generally. KPMG won’t want to comment on a specific loan but it is understood that the option offered by KPMG to borrowers for refinancing of a borrower position is to refinance it at par. 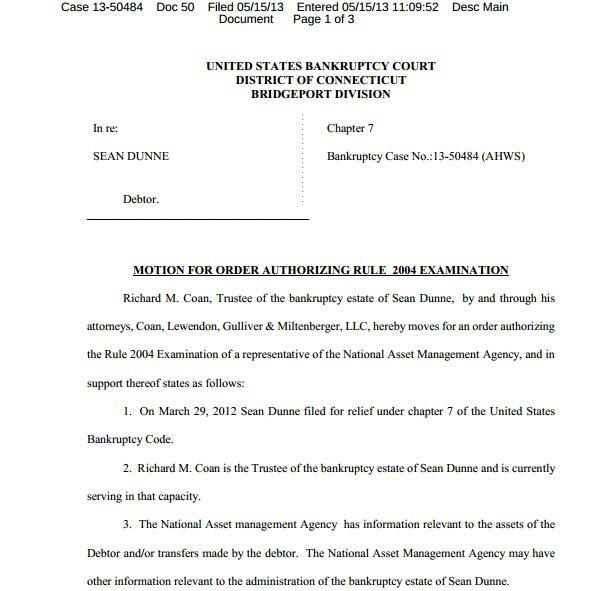 It has been relatively quiet this week with Sean Dunne’s bankruptcy in the Connecticut bankruptcy court – the creditors meeting that was scheduled for Wednesday has been moved to 29th May 2013 apparently at NAMA’s request, though given it had one working day to review Sean’s statement of affairs filed at 10pm last Friday, perhaps that request was understandable even if they had seen practically all of the information before when Sean presented NAMA with his business plan and accompanying documentation. The bankruptcy trustee was also scheduled to have quizzed Credit Suisse, People’s United Bank and a Bruce Shaw employee, Andy Smyth, this week. Last night, Sean did file a “means-test calculation statement” which is intended to set out in detail the income and expenses of the bankrupt. However, in Sean’s case, he unsurprisingly states that his debts are not primarily consumer debts, and is therefore exempted from providing the minutiae of his financial income and outgoings. For your information though, the statement is here. Also yesterday, NAMA’s lawyers, New Jersey firm, McCarter and English filed a statement – available here – with the Connecticut bankruptcy court showing that NAMA’s lawyer Thomas Goodwin is a lawyer is “good standing” and should therefore be accepted as NAMA’s legal representative in the Connecticut bankruptcy.